RTS fans around the world are having a party today; Starcraft 2 is out for both Mac and Windows, and you can download the game now directly from Blizzard or pick it up from various retailers. The game costs $60 regardless of whether you get the digital distribution/download or if you opt for the physical box. 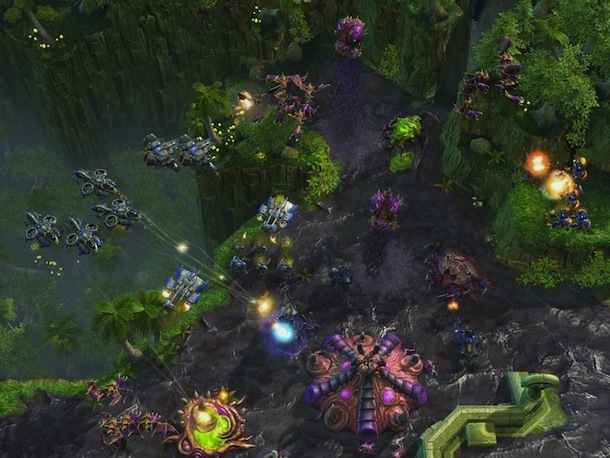 Be sure to check the Starcraft 2 system requirements for Mac before getting the game. Is it just me or do some of the scenes in Starcraft 2 look like they’re right out of Avatar ? That last screen shot looks identical to the big battle in Avatar, from the flying machines to the flying dinosaur beasts… gee I wonder if Blizzard are fans? I have the game waiting for me at home… can’t wait to get off work and play it! Actually, Blizzard designed those vehicles/units/map designs before avatar was even released. Some of the units depicted in the screenshot (such as the mutalisks, dropships, marines, etc) are from the original, 12 year old game. I believe that the similarities between Avatar and SC2 are coincidence. banshee design is very practical though seen it on starship troopers.